Is Old Trinity Church in Connecticut haunted? 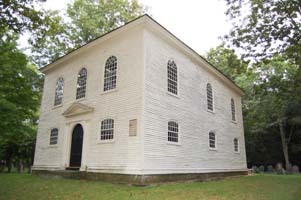 The original old trinity church was built in the 1700's, the church has only been used as such since its creation and is still open today, due to having no heating and being slightly small in size, another trinity church was built in the near by area to house the larger services. The only common reports of hauntings at this location are that of seeing the apparitions of young girls. A common tale for this location is that the infamous serial killer Michael Ross, left some of his victims body's near the church, there are some claims that he wrote "i love little girls" in blood on the church itself. Whether this is true or not is unclear, no official records can be found to prove one way or another, and the story's of seeing the apparitions and the body's being left by the killer could just be a folk tale.